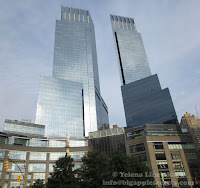 The Time Warner Center is located on Columbus Circle at the southwest corner of Central Park. It is the first major building to be completed in Manhattan after the September 11, 2001. The buildings consists of two 80 story towers with a bridge like atrium between them. Its scale is huge: a $1.7 billion investment bringing a major upscale shopping mall, a 5-star hotel, offices for 1,700 Time Warner employees and other companies, television studios, a jazz concert hall, residential apartments and more... 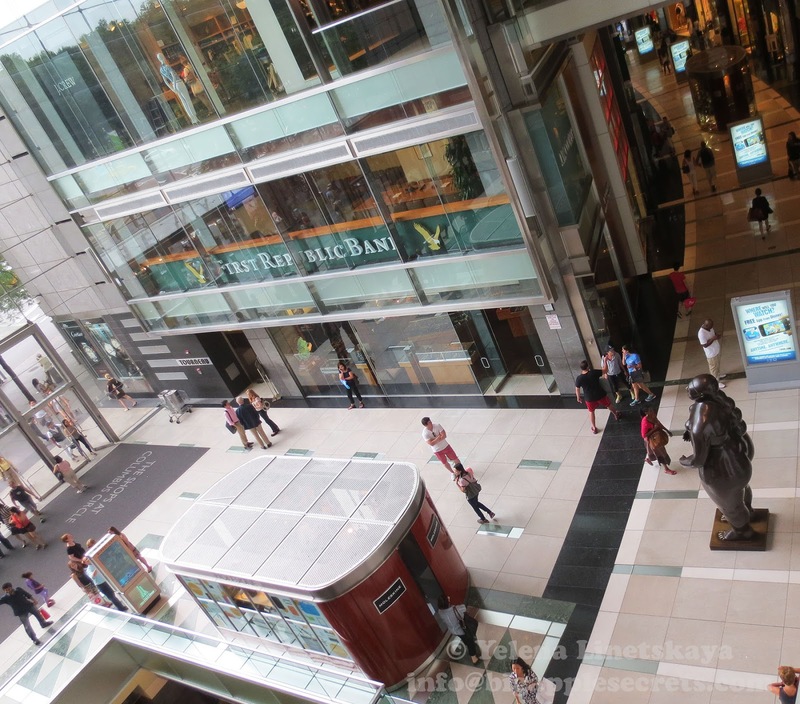 The Shops at Columbus Circle represent some of the finest shopping in New York City. You can read the story about the complex here. 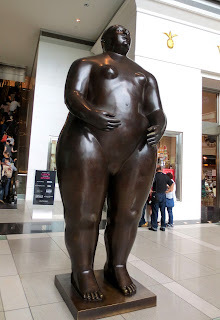 As soon as you walk into the Time Warner Center you are confronted by this very large couple who are not shy and clearly here to shop for some designer clothing. 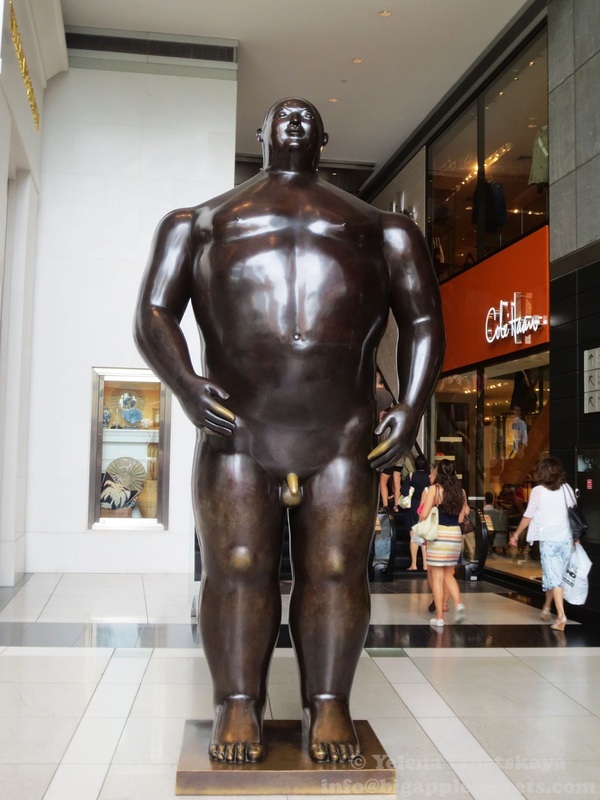 The twelve-foot statues were created by the Colombian artist Fernando Botero. Fernando Botero was born in 1932 in Colombia . In 1944 he took bullfighting classes with his uncle at La Macarena, the Medellin bullfighting ring. After a close call with a bull, Fernando decided to give up bullfighting and focus on what most interested him as a child: painting. 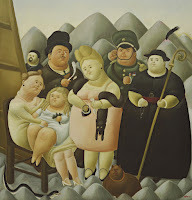 In 1948, Fernando Botero exhibited his work for the first time in his hometown. In 1951, Botero moved to Bogota. With the money he earned from the award and paintings he sold, Fernando Botero headed to Spain, to study at the Academia de Arte de San Fernando art school in Madrid. His signature style, also known as "Boterismo", depicts people and figures in large, exaggerated volume, which can represent criticism or humor, depending on the piece. He is considered the most recognized and quoted living artist from Latin America, and his art can be found in highly visible places around the world. Botero. Adam and Eve. Monaco. 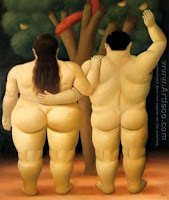 Botero is one of the world’s wealthiest artists. His paintings and sculptures sell for millions of dollars and are in the collections of more than 50 museums. In 2014 Fernando Botero set a new record at a Christie’s auction Monday night, when his bronze creation “Adam and Eve” ( different version) sold for $2.5 million. The previous record for the Colombian artist, known for his oversized and exaggerated figures, was $2 million for his painting “Four Musicians,” which sold in 2006. Adam and Eve , sculpted in 1981, stand in the gardens in Monaco, below the Casino. Botero donated 23 sculptures to sit in the plaza of his home town Medellin, Colombia and Adam and Eve are among them.